This is one of those times when I wish I was podcasting, because sputters and choking noises are so much more expressive than mere words. I’m still trying to figure out what the scriptwriters intended that little exchange to reveal about the characters, not to mention why they thought an exclusively nocturnal creature would know or care anything about exclusively diurnal birds. What’s weird is that this was my third encounter in three days with the “alcohol kills hummingbirds” rumor. Thursday morning a participant in a tour sponsored by Birds & Blooms Magazine asked me if I was familiar with Jack Aprill, the self-styled hummingbird guru of Leaming’s Run Gardens in New Jersey. I am, mainly because I was asked to help my friends and colleagues at the Cape May Bird Observatory deal with fallout from Aprill’s strident advocacy against feeding hummingbirds. Aprill’s condemnation of hummingbird feeders is based on the unsupported ideas that a) sugar water in feeders rapidly ferments into alcohol, which b) is a deadly poison to the birds. Before his retirement, he reportedly preached the evils of hummingbird feeders on his guided tours of the gardens, and his self-published book with the same message is still available. As it happens, I had reacquainted myself with Jack Aprill on Wednesday morning while drafting a response to a reporter who had been told that hummingbirds get cirrhosis of the liver from drinking fermented sugar water from neglected feeders, and that the mortgage crisis was escalating the problem because feeders were being left behind at foreclosed homes. The diabetes myth is easy to bust. White sugar, a.k.a. sucrose, is the main sugar found in the nectar of hummingbird pollinated flowers and not a direct cause of diabetes even in humans. Too bad the alcohol issue isn’t quite so straightforward. Home brewers and wine makers understand deliberate fermentation inside and out, but there seems to be little research relevant to fermentation rates “in the wild” and none whatsoever on the effects of ethanol consumption on hummingbirds. I’d just as soon stay in the dark on that second point than imagine some biology student or Ph.D. force-feeding alcohol to hummingbirds, but documenting the rates at which hummingbird feeder solutions ferment sounds like an excellent science fair project (hint, hint). From my own research on free-living hummingbirds, I’m highly skeptical that alcohol presents a health hazard. Most banding studies, mine included, are based around feeders, and patterns of longevity in these studies provide insights into their impact. Feeder-using banded hummingbirds are living to ripe old ages, far longer than we would have guessed possible for such a small creature, which suggests that if small amounts of ethanol are killing them, it’s doing so very…very…sloooowly. This makes sense from an evolutionary perspective. Any sufficiently dilute solution of sugar(s) and water, including nectar, tree sap, and the juices of overripe fruits, has the potential to ferment. If a sugar solution sits around long enough in the open air, wild yeasts will colonize it, consuming the sugars and excreting ethanol (“grain alcohol,” the drinkable kind) as a waste product. 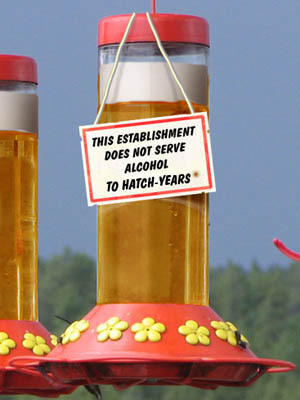 Any creature that can’t tolerate small amounts of ethanol, whether over short- or long-term exposure, would be poorly adapted to a diet of fermentation-prone nectar and should have been weeded out by natural selection long before hummingbird feeders came on the scene. In fact, as is the case for the primitive beers brewed by our ancestors, the yeasts may give natural nectar a nutritional boost, and the alcohol they excrete may discourage the growth of pathogenic microbes. So, we can safely assume that hummingbirds must be able to tolerate some alcohol, but we still have no evidence for how much alcohol it might take to kill a hummingbird outright or lead to fatal liver disease, or even whether they get drunk. (Bees do, but at least one nectar-drinking mammal holds its liquor really well.) This is one place we commonly go astray in relating to the natural world: expecting what we know (or think we know) about ourselves to apply equally to species that evolved with vastly different opportunities and challenges. That’s the origin of the myth that white sugar is bad for hummingbirds. It certainly is unhealthy for big, sluggish mammals like ourselves in the unnatural quantities we consume these days, but in any quantity it’s a perfectly natural, even essential fuel for tiny hyperactive birds. I’m not saying that alcohol is an essential nutrient for hummingbirds, but I wouldn’t be surprised to learn that they have a much higher tolerance for the stuff than we humans, who have only had regular access to large quantities of it for a few thousand years (since we learned how to brew beer and wine). I’m an open-minded skeptic, so if anyone has any evidence to support (or debunk) the cirrhosis claim, please contact me (especially staff and volunteers at wildlife rehabilitation centers, who would be the only people in a position to document liver disease in wild hummingbirds). In the meantime, keep up the regular feeder maintenance and support organizations that work against documented, serious threats to hummingbirds and other wildlife, such as habitat destruction, climate change, pesticides, invasive species, free-roaming cats, collisions with windows, communications towers, and other man-made obstacles, and possibly even red dyes. And don’t forget the thousands of people and pets left homeless by the mortgage crisis—they’re in dire need of our concern and advocacy. *Addendum: The vampire hummingbird expert specified honey water, and non-fictional hummingbird experts often warn against it, too, though mainly because honey has been reported to cause a fungus-like disease of the throat and tongue (presumably candidiasis). This is almost an urban myth itself, as no one seems to have any hard evidence linking the two, but there are other good reasons to avoid using honey in hummingbird feeders. The vampire was correct that honey ferments rapidly when diluted to feeder strength, in part because its main sugars, glucose and fructose, are readily used by yeasts. These simple sugars predominate in the nectars of insect-pollinated flowers, while sucrose, a disaccharide, predominates in bird-pollinated flowers and is preferred by hummingbirds. Even if honey contained the “right” sugars to feed hummingbirds, it’s extremely expensive. So for happy, healthy birds, cleaner feeders, and a bigger bank balance, stick with plain white sugar. I’ll be visiting my home state of Texas September 11 through 14 for the 20th anniversary of the Rockport-Fulton Hummer/Bird Celebration. The Texas coast is one of my very favorite birding destinations, and I hope to get out for a little face-time with shorebirds, wading birds, raptors, and songbirds as well as hummingbirds. If you’re a reader of Life, Birds, and Everything and plan to attend the festival, please hunt me down to say hello! I’m almost a year behind on this article in Science Daily, but this might explain something I’ve observed when banding hummingbirds. In females during the nesting season, I often see what appears to be tiny spiders floating around in the liquid in their crops (the skin and esophageal wall are extremely thin and so close to transparent that a well-filled crop looks like a goth snow globe). The habitat along the San Pedro River is rich in other invertebrates, including gnats and leafhoppers that also show up in crop contents, so are the females hunting spiders preferentially, and if so, why? Maybe to build smarter, more competitive offspring. Hummingbirds have pretty large brains anyway, but feeding them a diet rich in the amino acid taurine, of which spiders are an excellent source, may be a way that mothers build brain quality into their young. I have yet to find a way to sample what the birds I band are eating without putting their safety at risk, so I’m not certain of either the identification of the critters in their crops or the proportion of one prey item to another, but the article seems to support this casual observation and provide a possible reason behind it. And speaking of large brains, I have to thank GrrlScientist for leading me to the article cited above through a link to an article on brain size and evolution in her regular Birds in the News feature. Large brains have long been hypothesized to favor species diversification by giving their possessors the behavioral flexibility needed to exploit new ecological opportunities more rapidly and efficiently than smaller-brained competitors, and now there’s evidence to support this “behavioral drive” hypothesis. Ecologist Daniel Sol of CREAF-Autonomous University of Barcelona and evolutionary biologist Trevor Price of the University of Chicago analyzed measurements of 7,209 bird species and found that those bird families that show the greatest diversity in body size tend to have proportionally large brains. The use of encephalization as a measure of intelligence is somewhat controversial, but one study found that the brains of hummingbirds averaged 2.5 times as large as those of gallinaceous birds (which include chickens, turkeys, quail, and pheasants). Though we’re still working out how hummingbirds brains are organized and how much space is devoted to the thinking/learning parts of the brain versus those that control the birds’ complex motor and sensory functions, we know that hummingbirds can learn songs, keep track of what flowers they’ve visited and how long they take to refill, and remember feeders and flower patches along their migration routes from year to year. The natural limits on how large or small a hummingbird can be make the size range of living hummingbird species a poor measure of evolutionary diversification, and diversity of plumage, behavior, and ecology are harder to quantify for comparison to brain size, but these factors plus the large size of the Trochilidae (approximately 330 species, one of the largest bird families in the world) and their long life spans suggest that hummingbirds have seen big-brain evolutionary benefits comparable to those Sol and Price attribute to corvids (ravens, crows, jays, magpies) and parrots.